Since completing the restoration of my Military APD I have been asked on many occasions about the differences between it and a “normal APD”. One popular misconception is that all APDs were Military, the “A” meaning Army. This is not so, the APD was just a development of the PD. The various models of Military cars were supplied under a number of specific contacts with variations between and within contracts. My car was supplied under contract V 2816 and within this contract some cars had black hoods, some had green and a few cars had Vokes air cleaners. The differences shown in these photos are on my car, others may well be different! Wheels: The 17” wheels are unique to the Military APD. They are wider, have a different rim section and stronger spokes. In addition they have lifting lugs (cotton reels) riveted to the wheel centres. Fuel tank: The fuel tank is mounted under the bonnet, not at the rear and gravity feeds the carburettor. Whether this is for reasons of ground clearance or simplicity is a matter for conjecture! Towing Eye: There is a small towing eye located beneath the centre of the radiator attached to the front of the chassis. Armament! : This contract had a pair of “U” shaped supports mounted on the tunnel between the seats which carried a Lee Enfield 303 (SMLE) supplied by the Army. Storage: The space beneath the passenger seat had a lockable lid fitted to create a secure ammunition box. Contract Plate: Cars were fitted with a contract plate on the dash in front of the right hand dash pocket. This recorded the contract number and the car’s number within the contract, in this case V2816/29. Door Check Strap: The door check strap was a better design than the standard car. It was secured at the front in the “A” post. The webbing then passed through a steel lined slot in the front edge of the door. 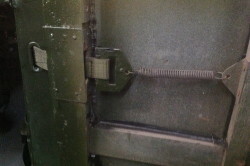 The end inside the door was then secured to a spring which ensured that it remained straight as the door was closed. This mechanism also appears to allow the door to open wider than the standard APD. Finish: All cars were painted Deep Bronze Green No 24 BS 381 which is still available today! With the exception of the instrument surrounds it seems that the philosophy was “if it doesn’t move paint it green” . If you think there were other differences I haven’t highlighted I would be interested to hear from you. This article, by Andrew Jarmin originally appeared in Seven Focus, December 2015 pp10-13. The Austin Seven Source Book by Bryan Purves, pub. by Haynes Publishing, Re-issued 2004. 1934 Military Tourer Type APD at pp413-414. There is an article in Classic Military Vehicle, Issue 74, July 2007 pp30-32 of Military Sevens owned, and restored, by David Morgan.